Note how the blue deepens as it rises, as if to suggest an unutterable perfection beyond the frame, just above the human figure’s clasped hands, that makeshift steeple. I love the idea of blue sky. I don’t know what to do with my life. When my mother was just about the age I am now, edging into the mid-40s, she quit her job and left her home. She had been working as an editor and writer of technical manuals for a synthesizer company. This was in the mid-1980s. She had raised two kids, my brother and me, and we were both safely away at school. She was accepted into the NYU graduate program for art history and found a room to rent in a duplex in Manhattan owned by a woman who lived there with her daughter. She had use of the kitchen but tended to stay away. She studied art textbooks in her little room eating takeout, a nervous new life, cheap deli soup and centuries of beauty. The figure in this card would seem almost sculpted, adamantine, if not for the entirely human facial expression, that uncertainty and self-consciousness, however slight, that cuts against the otherwise iconic nature of the portrait. The history of art is a history of disenchantment, of gods stumbling to earth, of humans in heroic poses reckoning that no moment is eternal, that the next moment, inevitable, will be some sort of undoing. My mom was older than most of her fellow students, many of whom had not yet ventured out into the working world, as my mother had many years earlier. The department also reflected the tradition in that field of attracting members of the upper class, the future curators of major museums, those who had been practicing all their lives on Nantucket yachts and the slopes of Vail to float with grace and magnetic charm through gatherings of deep-pocketed donors. My mom didn’t have much in common with them. She had just gotten through two decades of raising children and getting by. She had been a painter herself, filling our house with colorful pop-art portraits of friends and family, and she had moved from that passion, when her family needed money, to the more stridently commercial artistic endeavor of opening and running a sign-painting business, and when that also didn’t bring in enough money she had edged away from art altogether for a while to just work and make a steady living, editing and writing the technical manuals. But art was always calling. Maybe because she had intimately experienced the pressure that needing money can exert on the creation of art, she was drawn in her new life to the study of popular art forms. Cartoons, prints, caricatures, comics: so-called low art. The kind of thing made to sell and sell cheap. The kind of thing everyone can get their hands on. This particular example of low art appeared in 1976, selling for 25 cents with 14 other cards and a piece of gum in a waxy plastic wrapper. 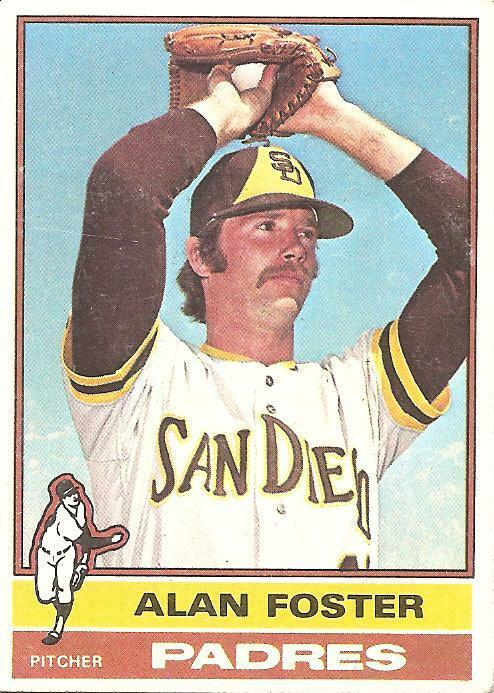 That year would turn out to be Alan Foster’s last in the major leagues, though he was also featured in a card in 1977. Here he wears the brown and yellow of the Padres, a homely juxtaposition to the backing blue sky, but he had come up in the system of the Los Angeles Dodgers, seemingly destined for a career entirely in blue, the life of a Dodger superstar. In 1967, with the Dodgers’ top minor league club, Foster had thrown two no-hitters, the first to ever do so in the history of the Pacific Coast League. This level of achievement did not transfer to the majors. In 1969 Foster surrendered a 506-foot blast to Willie Stargell, the first home run ever hit out of Dodger Stadium. The next year he was shipped to the Indians. He went from the Indians to the Angels to the Cardinals and finally to this last stop, the Padres. After completing her master’s level course work, my mother spent several years researching a PhD thesis on a 19th century French caricaturist named Honoré Daumier. She spent most of a year in a small apartment in Paris. Every day she went to the national library and requested materials from the archives in her timid but capable French and worked. I visited her for a week or so in the spring, taking an unpaid break from my job at a liquor store. I walked around a lot. I looked at a lot of art. I played basketball with some French guys in a park near my mom’s apartment. They were fairly skilled but soft and didn’t know or care about boxing out, so I kept grabbing offensive rebounds and finally, after otherwise playing terribly all game, I scored the winning basket on a tip-in. It’s ridiculous what stays with you, what haunts you. Later that day I took a tour of some underground catacombs filled with thousands of human bones and skulls. Ever since then I have periodically thought of my skull below the skin of my face, just waiting there for the temporary covering to fall away. Here in Topps 1976 card number 266 there is a covering of homely yellow and brown. Everything goes from one thing to another to another, declining, and everything goes from one thing to another and another, on up to a vanishing into blue. One day during my visit to Paris my mother took a day off from researching and we went to Chartres. We took a tour with a British tour guide famous for his illuminating spiels and erudition and learned devotion to the cathedral. He had based his whole life on one thing, that cathedral. I remember wondering how anyone could limit themselves like that. I don’t remember anything specific about the tour except that the guide was entertaining in describing the years of anonymous human toil that went into the creation of the cathedral, and that at the end of the tour he deftly let us all know that he needed our tips to survive. We all looked down at the ground and dug in our pockets for bills and coins as the cathedral beside us pointed unequivocally upward, toward an unutterable idea, the perfection of blue. mind blowing what a baseball card inspires. hopefully black infinity becomes perfect and beautiful too. i don’t see self conscious on Mr. Foster’s face. “yeh right” to all the hype. he seems to be aware what’s behind that blue sky. I know nothing at all about baseball. I’m a cricket dyke. You and Steven Myers both make me (with ease) read stuff with a baseball hook. You write, you rock. End.